The purpose of this exercise is provide hands-on learning in how to create a Cash Flow Forecast that predicts the month-end bank balance for every month of the year. A cashflow template is provided. 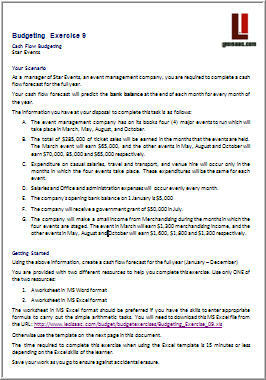 In this scenario, you are the manager of an event management company and you are required to prepare a cash flow forecast. Your cash flow forecast needs to predict the bank balance at the end of each month for every month of the year. The information you need is provided in the exercise instruction sheet provided. Download the Exercise Instructions sheet for Budgeting Activity 9. You are also provided with a template in Microsoft Excel to assist you complete the exercise. You will need to enter appropriate formula to carry out the simple arithmetic tasks. Download the MS Excel file for the Cash Flow Forecast. The time required to complete this exercise when using the Excel template is 20 minutes or less depending on the Excel skills of the learner.